Oh Supernatural, I heart you. I’ve been following you around my entire life. I’ve been looking up to you since I was four, Dean. Studying you, trying to be just like my big brother. So yeah, I know you. Better than anyone else in the entire world. […] It’s just I wish you would drop the show and be my brother again. 'Cause… Just 'cause. This whole speech just broke me. It’s so well executed from the acting up to that beautifully composed music playing in the back. Dean all choked up, averted eyes and genuinely surprised at the role he apparently played in his brother's life. You're slow on the uptake sometimes, pal. And that’s just so heartbreaking. He’s all this self-confident and badass on the outside but he’s having such a low opinion of himself it makes me want to wrap him in my arms and rock him gently. And Sam. Sam needs a hug just as bad. 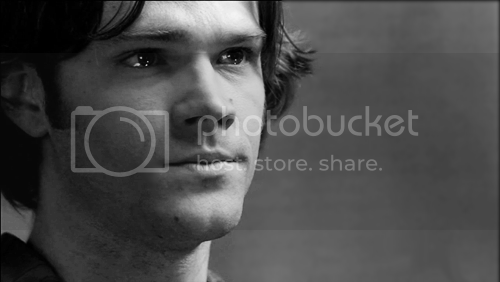 Jared blew me away here, all quivering lip, trembling voice and teary eyes. 'Cause it’s like I lost you already… Just cause. They’re both wearing darker colors. Me likey. Especially their new shirts and Sam’s new jacket. The way Gordon fleetingly scratched his nose when debating with Bela was kinda cute. Yeah, there you have it. Gordon, I shall miss you evil nutcase. I guess the tragic thing about his character is that he’s so unbelievably misguided, has this twisted sense of right and wrong. It’s like accepting a world with shades of grey in it would be too hard to bear because really, who could you trust, what rules would apply? He’s lost as it is and human and monster is the only difference he knows. I found it nicely done to see how vamp!Gordon was struggling with his bloodlust as he spied the guy changing his tire. I almost felt sorry for Gordo when he lost it to his hunger after all. I loved Dean’s Stay close, Sammy!. Like he knew bad things would happen. It’s time. You should know how to fix it. You’re gonna need to know these things for the future. Just… *gulps* Just how this doesn’t only apply for the car is so deeply disheartening. And this It’s time at the beginning is like a stab to the heart, like a ticking clock in the back that’s constantly reminding you that there just won’t be enough time left to teach your brother everything you wanted to. I guess the hardest part about partings is the knowledge that this is goodbye. Oh boys. Can I just say I’d love to have Sterling as a guest at Asylum08? Cause I do. I want inside information about that comparing-muscles scene of his and Jared. Also, he was such a disturbed badass on the show, it would be fun. Look at those sad puppy eyes and the furrowed line between his brows. This is as hot as it is heartbreaking. LOL They were! I keep rewatching those two scenes over and over and I still tear up each time.